Get ready to take the battle to the enemy and win the war! The iBomber series moves out to the Pacific as you fight a whole new enemy in an effort to secure territory on the Pacific Rim. iBomber Defense Pacific takes tower defense to a whole new level. Feel like you’re right there and part of the incredible action as you use the new deep strategy options to protect your base. 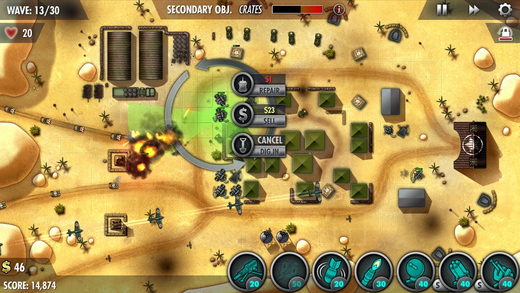 Building on the success of its predecessors, iBomber Defense Pacific has all-new tactics, all-new strategies, all-new maps, all-new weapons, and all-new enemies. Tower defense has never looked so good. Luscious jungle greens, incredible water effects, jaw-dropping explosions, intricately designed vehicles and turrets come together to make on of the best looking strategy games in years.